We discovered Katie Klein (alias La Kocinera) through our Kimchi Chronicles Video Contest with her rendition of bulgogi tacos, and have been hooked on her blog ever since. A college student living in Texas, aside from exams and serious amounts of reading, Katie somehow finds time to whip up some amazing things in the kitchen. She’s also a certified cake decorator, which is no joke. 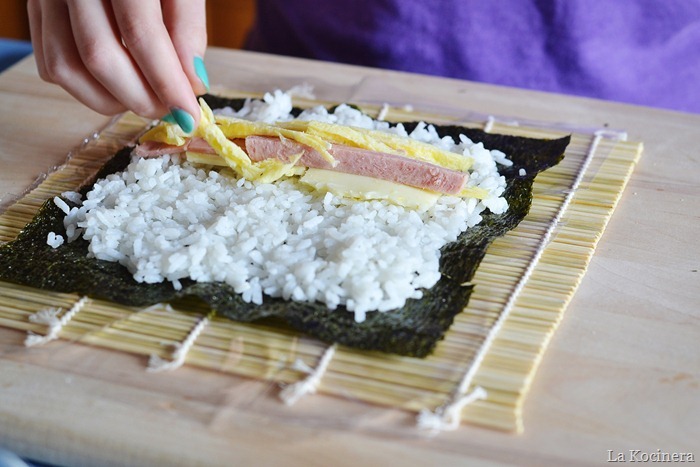 Her blog is dedicated to documenting in her love of food, and we’re more than to share her unique take on gimbap with you all. Once in a long while, among the dozens of sweet treats and savory concoctions that I chat about on my blog, there comes a dish that I feel extra-super-duper excited to talk about. 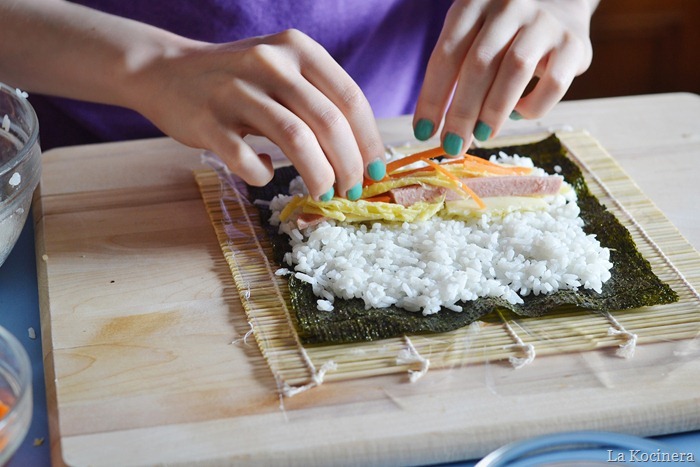 Gimbap is one of those dishes. 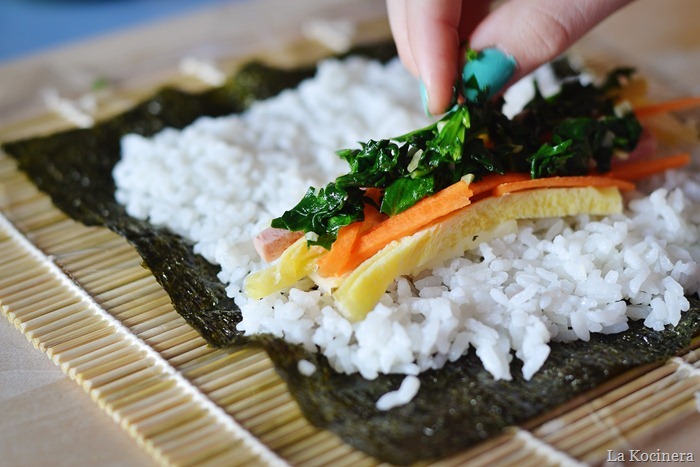 The quickest and easiest way to explain gimbap (pronounced “gheem-bahp”) to the uninitiated is to call it the Korean version of sushi. 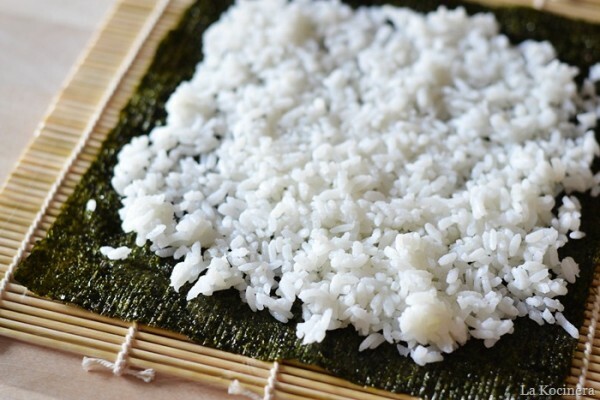 Dried seaweed, topped with steamed, short-grain rice, and plenty of yummy fillings are all wrapped up into a tight roll. 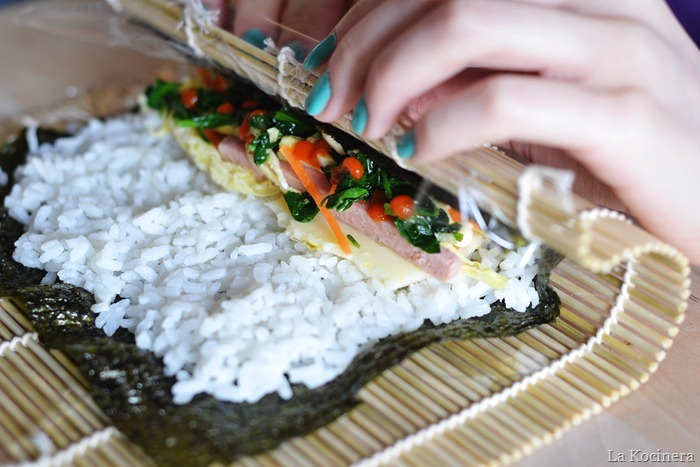 Following these basic guidelines, you can tailor gimbap into whatever sort of dish you want. 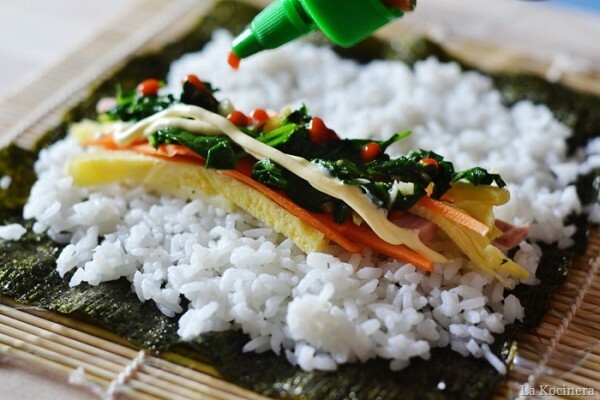 Typically, they are filled with julienned carrot, sautéed spinach, and pickled daikon radish. After these basic cornerstones, anything goes! Add meats, cheeses, other veggies, kimchi—whatever sounds good. 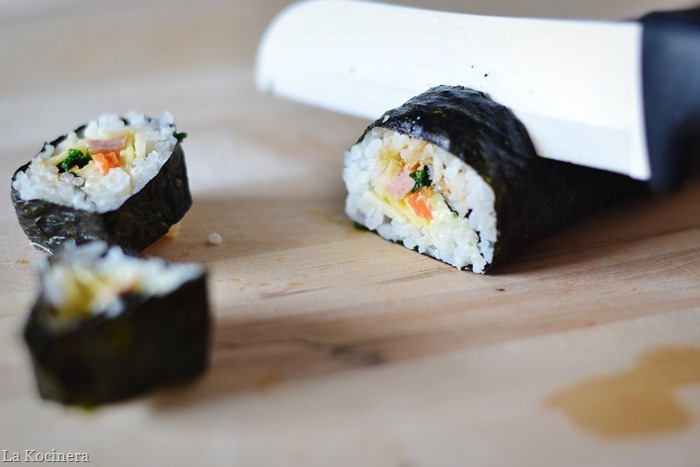 Gimbap falls into that glorious realm of recipes that allow you to completely clean out your fridge as well as experiment with a lot creatively. 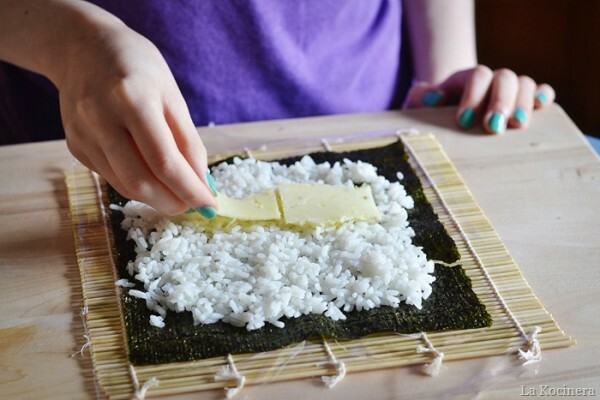 First, seaweed on plastic wrap on a sushi mat. 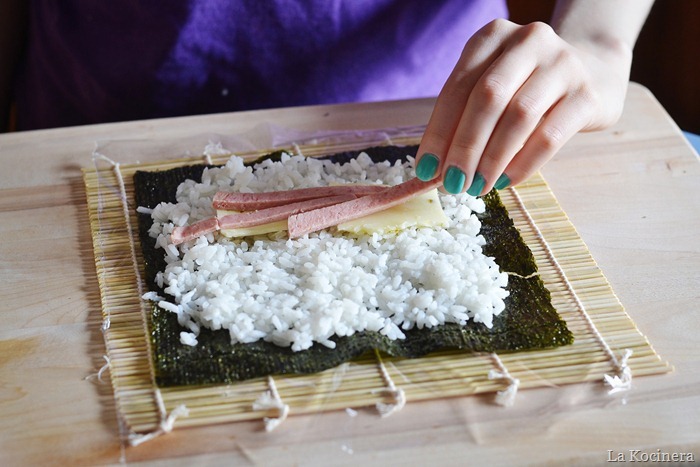 Plastic wrap alone will definitely suffice if you don’t have a sushi mat. Thin strips of Spam. Yes, Spam. Enter the Kewpie mayonnaise! 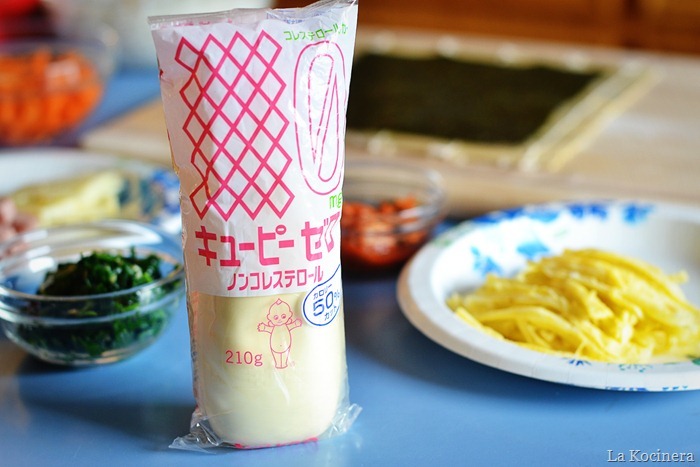 This Japanese Mayo makes everything just a little more fun. 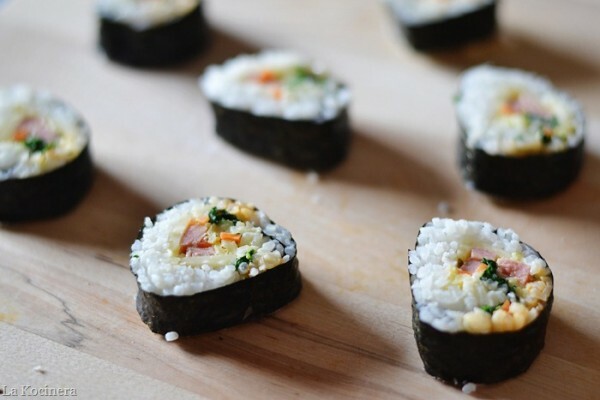 With a taste similar to a mixture of regular mayo and Miracle Whip, you can substitute either one and your Gimbap will still taste amazing. Dot the filling with Sriracha sauce (again—substitute whatever favorite sauces and spicy things you like). 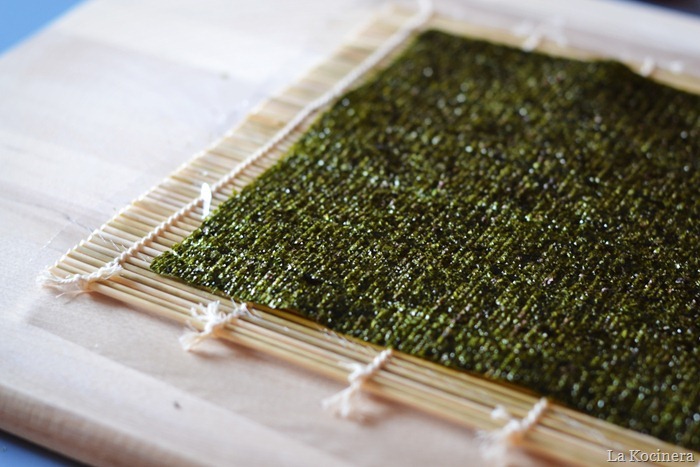 Moving from the side closest to you, begin to roll the mat and seaweed away from you…… Adjusting the placement of the mat as you go until all the filling has been rolled up. Dip a knife blade in water and use a gentle sawing motion to cut the Gimbap, so as to not tear the seaweed. And enjoy! !